Combine the fields of organocatalysis with that of domino reactions and you have created the brand new field of organocatalytic domino reactions. This science is of some importance because it is as close to biomimetic synthesis as you can get. The basic idea is to synthesise complex molecules from a mix of several simple molecules and a simple organocatalyst. With a chiral catalyst as an added bonus, the reaction is also asymmetric. Advantages in general: no metal catalyst therefore potentially environmentally friendly, avoids use of protective groups. Many handles exist for this particular field, to name just a few: organocatalytic cascade, domino, tandem, multicomponent, assembly, organoclick or variations on catalytic organocascades. Here is what happened thus far. The first relevant work (the classic 1917 tropinone synthesis aside) appears to be produced by the laboratory of Carlos Barbas in 2002 concerning Hajos-Parrish chemistry joining three molecules of acetaldehyde together to a complex hydroxyhexanal (DOI) and in another exploit a pyranose forms from propionaldehyde (DOI). In a 2004 paper Barbas et al. are making a case for (DOI) so-called organo-click chemistry based on organocatalytic multicomponent reactions with reference to click chemistry (invention of Cripps buddy Sharpless), for instance with a Domino aldol/Knoevenagel/DielsAlder reaction. Typical reagent set: Meldrum's acid, 4-nitro substituted benzaldehyde and acetone with pyrrolidone catalyst in an ionic liquid. In 2005 three big guns in organic chemistry set their sights on organocatalytic cascades with three JACS publications separated by just 13 days : List et al. (DOI), MacMillan et al. (DOI) and Jorgensen et al. ( DOI). The first system combines organocatalytic transfer hydrogenation with an Hantzsch ester and Michael cyclization using a McMillan catalyst. 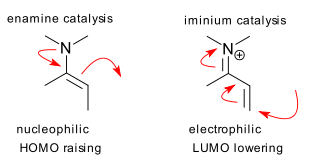 The second system is sequential nucleophilic attack (a furan) and electrophilic attack (a chlorine donor) on crotonaldehyde using the same chiral catalyst for step one. The third system is almost identical to the second based on iminium / enamine activation. This time the nucleophilic partner is a mercaptane and DEAD is starring as the electrophile. What these three systems have in common is sequential iminium catalysis (electrophilic) and enamine catalysis (nucleophilic). This order is reversed in a report by Enders et al. in 2006 (DOI) creating a cyclohexene carbaldehyde with 4 new stereocenters from propionaldehyde, a nitro alkene and an enal. and Penon (DOI), again inspired by Enders, demonstrates another cascade, forming 5 stereocenters in one go one of which qauternary and listing cyanoacrylate as an unlikely reagent (the authors haste to note that this compound can be found in superglue).